CASTLE COMBE has been called the prettiest village in England, so it may be surprising that many of us will have only seen it on screen - as the fictional Puddleby-on-the Marsh in Dr. Dolittle, the 1960's film with Rex Harrison, and more recently a backdrop to Steven Spielberg's film War Horse. This magical village was once a weaving town at the heart of the Cotswolds wool trade: you can still see weavers' cottages where the local red and white cloth was produced. In St Andrew's Church, don't miss the Norman monument to a knight; his legs are crossed to indicate that he fought in the Crusades. Also in the church is a medieval faceless clock, one of the oldest working clocks in the country. It is not all chocolate box perfection. If you are a Petrol Head, visit the nearby Castle Combe motor car racing circuit said by Jeremy Clarkson to be one of the fastest in Britain. Its adjacent wooded hill was fortified by Britons, Saxons and Normans and like most other places in the Cotswolds, Castle Combe's prosperity was based on sheep and wool. The village was important enough at one time to be granted the privilege of holding a fair where wool and sheep were traded. The village is built around the 14th-century Market Cross with the old water pump beside it. A few yards away are the remains of the Butter Cross which was dismantled during the 19th century. St. Andrew's Church is probably 12th century and of particular interest inside is the modified 15th-century faceless clock (one of the oldest working clocks in England) which used to ring the hours from the tower. The monument tomb of a Norman Knight (mentioned above) is that of Sir Walter de Dunstanville, Baron of Castle Combe, who died in 1270. With his feet on a lion he has his hands on his sword suggesting that he died in battle. The classic view of the village is from across the bridge by the old weavers' cottages. The small local museum is up the hill away from the village towards the parking area (where tourists to the village are requested to park). 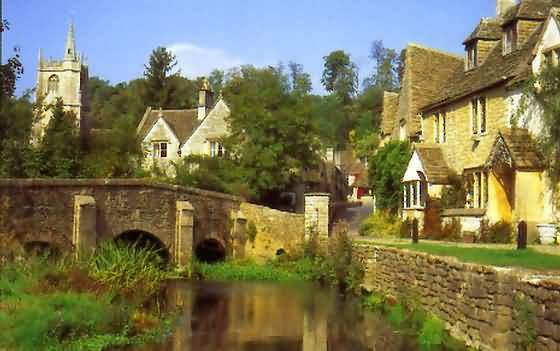 Castle Combe village (not far from Lacock) is a popular Filming location with film crews. Part of 'The Wolfman (2009) ' shot here and the TV series Agatha Christie: Poirot (1989): 'The Murder of Roger Ackroyd TV Episode'. Other films include Doctor Dolittle (1967) and Stardust (2007). More recently used as the backdrop to Steven Speilberg's film War Horse. Castle Combe Racing Circuit opened just 18 months after Silverstone in the summer of 1950, making it one of the longest established circuits in the UK. Until 1999, the circuit followed it's original layout, around the perimeter of the old air base. In that first year, a young Stirling Moss won a race and over the next few years, names like Mike Hawthorn, Colin Chapman, Les Leston, Roy Salvadori and John Surtees thrilled huge crowds. For more Cotswolds Motor Sports see details of Prescott Hill Cimb near Winchcombe.